What every woman should have in her wardrobe? A flattering pair of jeans, a white silk shirt, and a casual blazer. Why? They all look good together, so they are a safe bet on days when you simply can't decide what to wear. They also make a great canvas for other, more daring clothes. How to accessorize them? With pearls, naturally! We particularly love the black & white color combination in pearl necklaces, which gives them a modern tough-luxe feel. This juxtaposition of contrasting tones has lately become very popular on fashion runways. The necklace shape of a casually tied chain is very versatile and works well with unbuttoned shirts or v-neck necklines that are flattering to all of us. Our version of the necklace costs only $73 and its intricate silver chain beautifully complements the two 8.5 mm drop pearls. Remember, looking stylish doesn't require spending your entire salary on your clothes! To prove it to you, we created two versions of the same outfit. The less expensive version that includes our Yan & Ying pearl necklace costs only a fraction of the high fashion pieces, but the look is almost the same! What every woman should have in her wardrobe? A flattering pair of jeans, a white silk shirt, a casual blazer ...and a pearl necklace to wear with them. Still looking for this perfect holiday gift for her? We have prepared a short and sweet holiday gift guide to give you an idea what to get for your girl or lady. Remember, you can still benefit from our 20% off on the prices shown below and free worldwide shipping until the end of the year! Use discount code XMAS2012 in the discount coupon field during your order checkout. Details of our promotions are here. 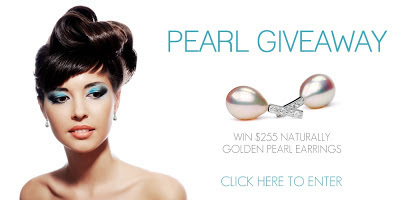 If you're looking for some new stunning additions to your jewelry treasure chest, why not try your luck in our Bree Pearl Earrings Giveaway? These head-turning metallic golden pearl earrings are set on silver and zirconium posts and their color is perfectly natural. How to enter? Head to Denise's blog for up to 35 free entries in the giveaway. This contest ends on December 11th - in 3 days - so there's no time to lose!